Our Vogue small single mattresses are designed to be comfortable and durable whilst only being 75cm wide - making them ideal for kids’ beds or smaller guest bedrooms. These Vogue mattresses all offer an excellent quality product that is available at prices that won’t break the bank. 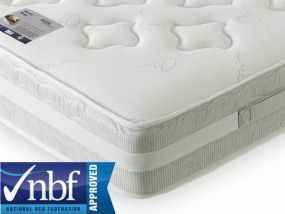 The entire range is National Bed Federation Approved for both comfort and design. Our small single mattresses are available in orthopaedic, memory foam and pocket sprung options that are all totally hypoallergenic in a choice of Medium and Medium Firm to offer excellent all round support and promote a healthy sleep. Many of our Vogue small single mattresses are manufactured within the United Kingdom and our free bookable delivery service means you can select the ideal date for the delivery of your new mattress; you can even book a Saturday! The convenience of our delivery service and our excellent customer service record that is backed up by many positive reviews means that the purchase of your new Vogue mattress through Bedz ‘R’ Us is totally hassle-free.